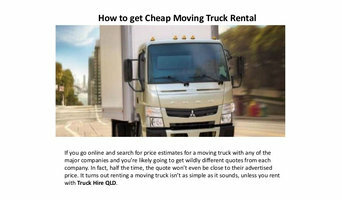 Truckhireqld.com.au is a truck rental company on the Gold Coast that offer FREE delivery and pick up to and from your front door at no extra charge! A Goodwill Carrier are a Gold Coast based Removalist business who are dedicated to making the process of moving as easy as possible for you. We make sure you are comfortable from the moment you book in until the moment your possessions safely arrive at their new destination. A Goodwill Carrier is a locally owned business who offer quality service, every time we move you. We are here to help you with all of your moving needs, whether that be a small home or taking care of your Business move. We make sure your valuables are valued, every step of the way, just as you would. We understand that moving is a very stressful time so our commitment is to take that on for you so you can focus on the other necessary things involved with your move. Brisbane Euro Specialists (BES) isn't your average workshop. Our technicians have a combined 40 years experience with worldwide recognized certifications and training. Not only does our team consist of technicians, we are also the official Gold sponsors of the BMW Club QLD. Are you moving your home or office and looking for a Gold Coast removalist? Call Better Removalists Gold Coast! We offer professional service like furniture removalists, piano removalists, packing and unpacking of your goods, Interstate move from Gold Coast and more. Our removal process is quick, efficient and safe. Our team is fully skilled and will make your move comfortable and tension free. Our Cheap Removalists Gold Coast services are gradually expanding all over Australia and have received stellar reviews from the Gold Coast all the way to Western Australia. Our staffs are highly trained, and customer representatives are available for 24 hours. So, you can call us now and book your move with us and relief yourself from worries. Removalists Gold Coast – Cheap Moves is the leader in low cost, high quality furniture for Gold Coast Removals. From a mini move to a large house we provide unbeatable value for money. Elanora Mini Moves can ensure a smooth stream of moving procedure. Our group of movers is very much prepared and authorized to offer all the migration necessities of our clients. Our master and instructed staff make us a standout amongst the most believed neighborhood evacuations situated in Murwillumbah. They can deal with a wide range of family unit and office merchandise without hardly lifting a finger. Our master moving administrations incorporate everything - pressing, stacking, transportation, emptying and unloading, leaving no purpose behind you to stress over. We realize moving is the primary angle in somebody's in adventure with their life so we constantly offer the correct administration that every one of our client merit and need. We give our best exertion to give them a stunning moving background and feel trust we show improvement over the rest. Find companies in Gold Coast, Queensland that provide storage or moving services on Houzz. Scroll through this page to find a home removalist storage solution in your area. Just enter your suburb at the top of this page to narrow your search. Get contact information or message professionals directly so you can ask about rates, and read customer reviews.